CAPITOL HILL. 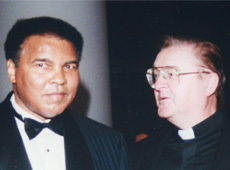 MONDAY, JULY 21, 2008 —– Recently the president of theCapitol Hill-based Irish National Caucus, Fr. 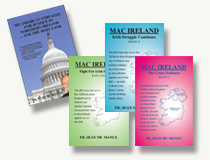 Sean Mc Manus, returned to hisnative Fermanagh for a series of events marking the 50th. Anniversary of hisbrother Patrick’s death on July 15, 1958. Patrick Mc Manus was a leading IRA man in the 1956-1962 campaign. He wasthe OC for South Fermanagh and shortly before his death he was appointed to theIRA Army Council. Mc Manus was killed in a premature explosion a few miles outside of Swanlinbarin County Cavan. A native of the townland of Clonliff, Kinawley parish (which isdivided by the Border). Mc Manus had been on the run since the beginning of theIRA campaign, December 12, 1958.What made his death at 29 all the moretraumatic for the Mc Manus family was that he was killed on the same day hissister was married – the first marriage in the family of ten children. There were a series of events commemorating the young Irish patriot. On Sunday, July 6, Sinn Fein led a parade from the town of Swanlinbar to McManus’s grave in Killaduff cemetery, two miles away. 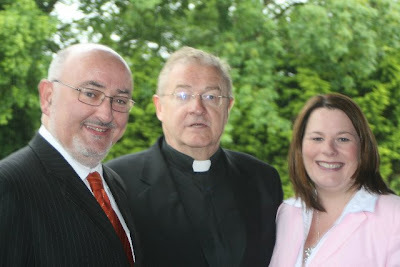 Michelle Gildernew, MP forFermanagh and south Tyrone, a constituency represented by Patrick’s brother,Frank, from 1970 to 1974, was one of the two main speakers. The other was theTD for Cavan and Monaghan, Caoimhghín Ó Caoláin. (Photo attached). On July 15, the surviving Veterans of the 56 Campaign laid wreaths on themonument that marks the spot where Mc Manus was killed. 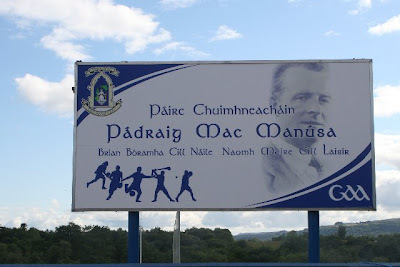 On July 12, the Kinawley GAA Club unveiled a new, striking sign, with Patrick’sphoto superimposed, at the Patrick Mc Manus Memorial Park, so named in 1982. (Photo attached). On Saturday July 19, Republican Sinn Fein unveiled a new roadside monument toMc Manus, James Crossan and John Duffy near the spot where Crossan waskilled by the RUC in 1958 – just across the Border in County Cavan, outsideSwanlinbar. (Duffy was killed in Derry in 1960 while training with the IRA). RuairiO’Bradaigh was the main speaker.